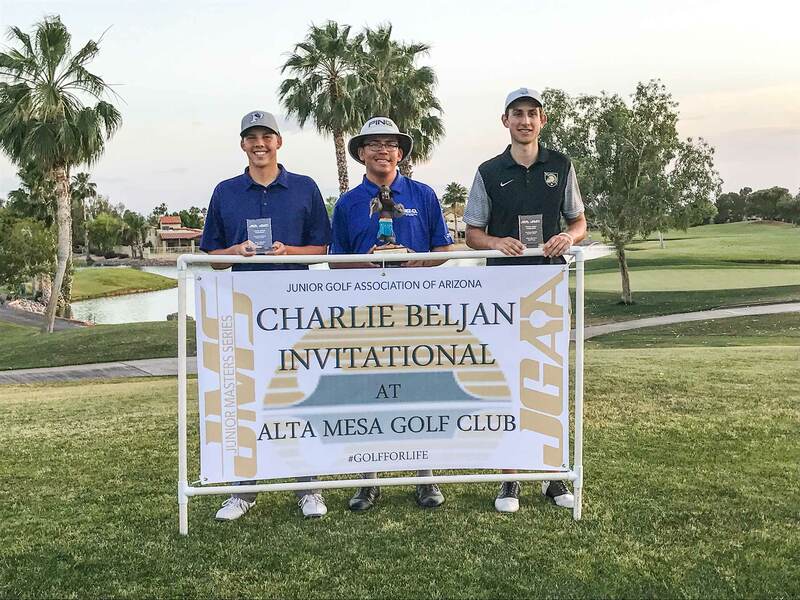 Daniel Thompson of Phoenix set the pace for a wire-to-wire victory with an opening-round, 1-under-par 71 on his way to a 1-over-par 145 finish for the 36-hole Charlie Beljan Invitational held at Alta Mesa Golf Club May 6-7. 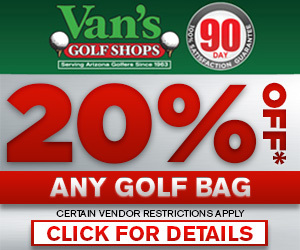 He edged out Tom Katsenes of Scottsdale by a stroke (73-73—146). Caden Christopherson of Chandler came in third place with a score of 77-71—148 (+4). Ashley Menne from Surprise posted another win in the Girls Division also with a 1-over-par 145 (73-72), besting second-place finisher, Kelly Su, of Scottsdale by six strokes 78-73—151. In seven events played so far this season, Menne has posted five wins and two second-place finishes. Madeleine Laux of Goodyear took home third place with at +9 for the tournament (80-73—153), while last year’s champion, Emily Mahar came in T5. 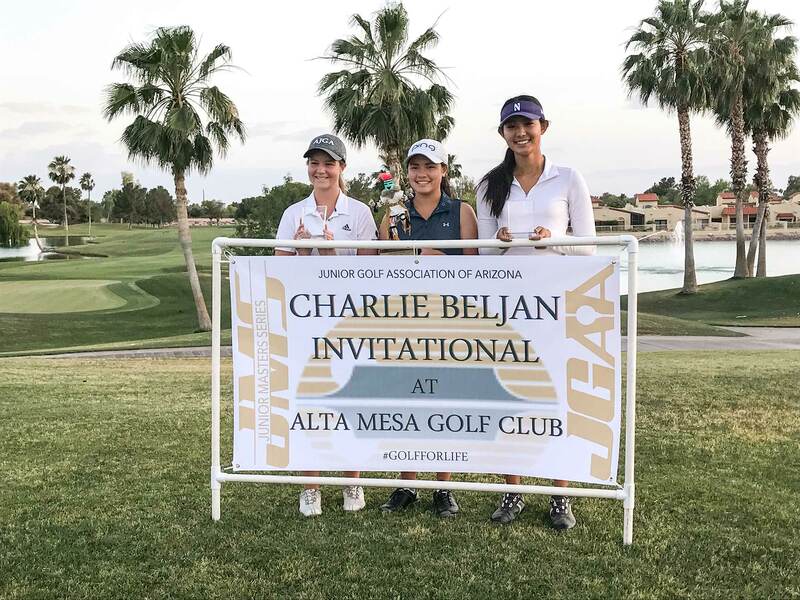 The Charlie Beljan Invitational is a JGAA Junior Masters Series tournament tailored to Arizona junior golfers with the desire and ability to compete locally against their top-ranked peers.  The field for the event was made up of 78 players who were invited to compete by virtue of their national ranking by Junior Golf Scoreboard – boys must be in the top 3,500 and girls in the top 1,500. Beljan joined another local professional golfer, Bryce Molder, as high-profile tournament ambassadors for the Junior Master Series, now in its second year. The next Junior Masters Series event will be the Willie Low Invitational presented by MJ Insurance at Phoenix Country Club on June 12-13.  Openings for junior players from neighboring states will be dependent on availability at each event. To learn more about the JGAA and the Junior Masters Series, contact Scott McNevin, JGAA Executive Director, smcnevin@jgaa.org, 602-944-6168.